Amritsar is one of the largest cities of the Punjab state in India. The city was named after the lake founded by the fourth Sikh Guru Ram Das in 1574 on land bought by him for 700 rupees from the owners of the village of Tung. Guru Ram Das had begun building Santokhsar Sarovar, near the village of Sultanwind in 1564. The weather in Amritsar is not for the faint of heart, with chilly winters and hot summers, but it can be quite pleasant between the months of October and March. You will always find cheap flight tickets to Amritsar with us from all Canadian cities Toronto (YYZ), Montreal (YUL), Ottawa(YOW), Vancouver(YVR), Calgary(YYC), Edmonton(YEG), Halifax(YHZ), Winnipeg(YWG), Saskatoon(YXE), Fort mcmurray(YMM) and Victoria(YYJ). Our staff knowledge to Amritsar and India is better than any one else. We have dedicated punjabi speaking experiened staff for Amritsar, India Flights. 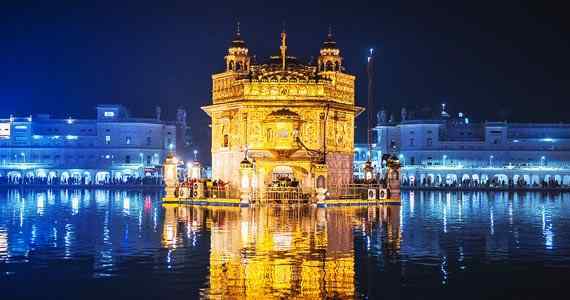 Book your Flights to Amritsar with confidence from Nanak Flights either online on our website, or by visiting our office or by calling our experienced staff. Amritsar (ATQ), is golden sunrises over the Golden Temple. Amritsar (Hindi: अमृतसर; Punjabi: ਅੰਮ੍ਰਿਤਸਰ), is the most sacred city of Punjab State, lies in north-western part of India, also known as Rāmdāspur & colloquially as Ambarsar. The city is situated 217 km (135 mi) northwest of state capital Chandigarh. Amritsar derives its name from the pool around the Harmandir Sahib (commonly known as the Golden Temple - one of India’s most serene and humbling sights), which means “holy pool of nectar” (Amrit: elixir; Sar: (short for Sarovar) or lake), the spiritual and cultural centre for the Sikh religion, where pilgrims take bath. The Golden Temple was initiated by Guru Ramdaas Ji, the fourth Sikh Guru, and completed in 1601 by his successor Guru Arjan Dev Ji. Best time to visit Amritsar is in the winter, between October and March. Amritsar city itself lies on the main GT road from Delhi to Amritsar. The city is also well connected to most other major cities such as Jalandhar, Gurdaspur, Pathankot, Ludhiana, New Delhi, Mumbai and Calcutta by an network of rail system.The city also provides air connectivity to major Indian cities, as well as international routes such as Birmingham, Toronto, Dubai, Singapore, London. Raja Sansi International Airport caters to all flights and lots of punjabis prefer to take flight to Amritsar. Our Secret to cheap flights to Amritsar is connecting with multiple suppliers and multiple GDS (Global distribution systems Sabre, Amadeus) to shop the cheapest fares and offer the cheapest fare to our consumers. We work hard to find the Cheapest flights to all your destinations. For the best deals, fill out our form for a free quotation by email and we will get back to you with unbeatable rates. To book your trip right away, use our booking search to reserve your tickets online instantly. Nanak Flights always giving added value to travelers & become the one stop destination, to get cheapest flights to Amritsar & all destinations worldwide. Use our online search engine platform to book cheap tickets online today and compare with other top airlines at the cheapest unbeatable prices from the comfort of your home or office. We have thousands of satisfied customers from GTA, Brampton, Mississauga, Toronto, Bolton, Malton, Montreal, Ottawa, Vancouver, Calgary, Halifax, Victoria, and Edmonton who have bought cheap tickets to Amritsar from us. We have also sold hundreds of cheap flights from India (Delhi, Amritsar, Ahmedabad, Mumbai, Hyderabad, and Bangalore) to Canada and USA. We understand our travelers that is why we always seeking enhancement in our valuable services by providing Hindi and Punjabi speaking staff to cater to tickets requirements for Amritsar of elderly people who speak Hindi or Punjabi only. You will always find cheap flights tickets to Amritsar with us from all Canadian cities Toronto (YYZ), Montreal (YUL), Ottawa(YOW), Vancouver(YVR), Calgary(YYC), Edmonton(YEG), Halifax(YHZ), Winnipeg(YWG), Saskatoon(YXE), Fort mcmurray(YMM) and Victoria(YYJ). We have dedicated English & Punjabi speaking experienced staff for Amritsar, India Flights. Book your Flights to Amritsar with confidence from Nanak Flights either by our online website portal, or by visiting our office or by calling our experienced staff. Feel free to share your advice, feedback. 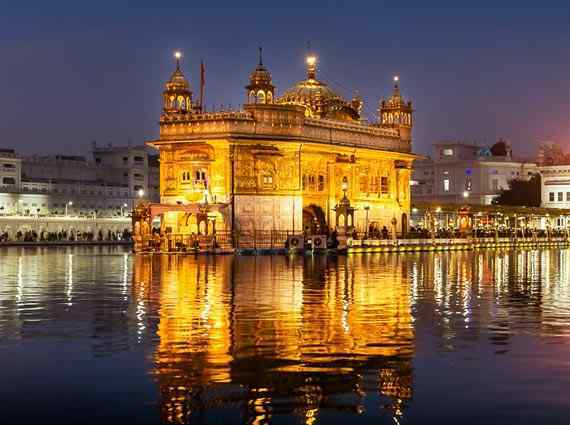 Our Secret to lowest pricing to Amritsar is connecting with multiple suppliers and multiple GDS (Global distribution systems Sabre, Amadeus) to find best flight pricing. 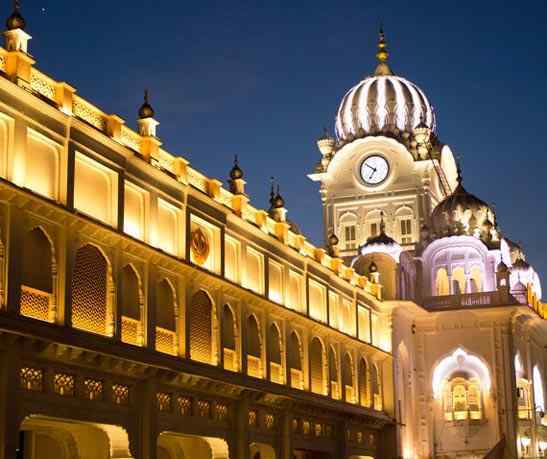 Amritsar is a city with a blend of tradition and culture. With important religious places and historical sites, the city reveals a magnificent past. Known as the holy city of Punjab, there are several heritage and religious attractions to be seen. 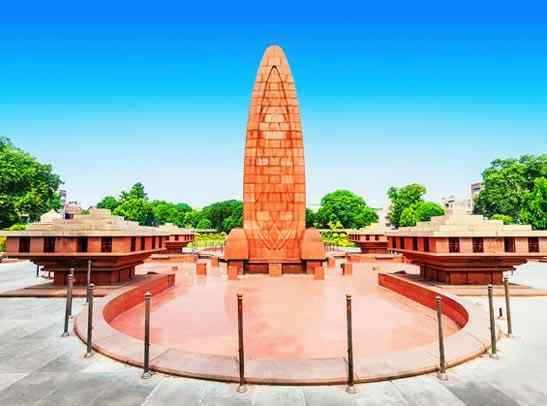 Some of the major attractions are the Golden temple, Wagah Border, Jallianwala Bagh, Durgiana Temple and Ram Bagh. AlphaOne Amritsar Shopping Mall - Alpha G:Corp is one of the fastest growing professional companies in the Indian real estate sector, with developments in over twelve cities across the country. Trilium - Designed by the renowned international architectural firm - RTKL, USA, Trilium is one of the few Indian malls that is compliant with LEED guidelines and is earthquake resistant. Celebration Mall - Book movie tickets online with Cinepolis in major cities like Ahmedabad, Amritsar, Bengaluru, Bhopal, Hubli, Jaipur, Ludhiana, Magnet Mumbai, Mangalore, Patna and Surat. Narula's Mall - Located in the heart of the central business district of the holy city of Amritsar, Hotel Narula's Aurrum is an oasis of peace, Serenity and tranquility. Amar Ujala Trimurti Shopping Complex - One of the best shopping malls. Following Airlines flying from Toronto(YYZ) to Amritsar(ATQ) airport in India. Jet Airways operates flights via London/Brusseles and Delhi/Mumbai airports. Air Canada operates flights via London/Frankfurt and Delhi airports. Air India and Air Canada operates flights via London/Newark/Chicago/New York and Delhi airports. Nanak Flights has a very special 90 days fare on Air India. If your return date is within 90 days, we can offer you special rates to Amritsar. Swiss Airline connets via Zurich and Delhi airports. Etihad airways also operates flights via Abu dhabi and Delhi airport to Amritsar. Lufthansa Airline connects via Frankfurt and Delhi airports. KLM Airline connects via Amsterdam and Delhi airports. Qatar Airline connects via London/Frankfurt and Doha airports. Custom and Immigration is done at the Amritsar airport. Travellers going to Punjab, India prefers Qatar Airways flight due to customs and through baggage at Amritsar Airport. Do you know the following interesting facts about Raja Sansi Airport Amritsar (ATQ)? The Airport is located 11 Kms from the Amritsar city center. The Airport Handles 48 Flights every week. Do you know that Golden temple in Amritsar attracts more tourists than any place in India. It attracts even more tourists than Taj mahal. The Amritsar airport has 2 integrated terminals 1 and 2. Terminal 1 is the domestic terminal and connects flights to various cities in India. Terminal 2 is the International terminal and handles International flights on Airlines like Air India, Jet Airways, Singapore Airlines, Qatar Airways, TransAero, Turmekistan. Lots of NRIS Punjabis prefer to arrive at Amritsar Airport due to Amritsar's proximity to various cities in Punjab. Transport options from Raja Sansi International Airport Amritsar(ATQ) to the City. Car rental service is available in front of International Arrival hall. General Taxi service is also available at the Airport. If you are planning to stay close to the airport in Amritsar, the following is a list of the best hotels close to the Amritsar Airport. We are RATED 4.5/5 by 1208 Google reviews for a reason. Book your Flights to Amritsar with confidence.